Workers in Paris swept up broken glass and towed away burnt-out cars on Sunday after the latest violent “yellow vest” protest while the government announced that President Emmanuel Macron would address the nation in the next few days. On Saturday, anti-government protesters wrecked havoc in the city for the fourth weekend in a row, hurling missiles, torching cars and vandalising shops and restaurants. Across the city, bank branch offices, toy shops, opticians and other retail outlets had boarded up storefronts smashed by protesters, and walls were covered in anti-Macron slogans. “You won’t make it past Christmas, Emmanuel,” read the graffiti on a boarded-up shop near the Champs Elysees boulevard. Macron, elected in May 2017, is facing mounting criticism for not speaking in public in more than a week as violence worsened. The upheaval in the Christmas shopping season has dealt a heavy blow to retailing, the tourist industry and the manufacturing sector as road blocks disrupt supply chains. On Saturday, the Eiffel Tower and other monuments and museums closed their doors for security reasons, as did top department stores on what should have been a peak shopping day. 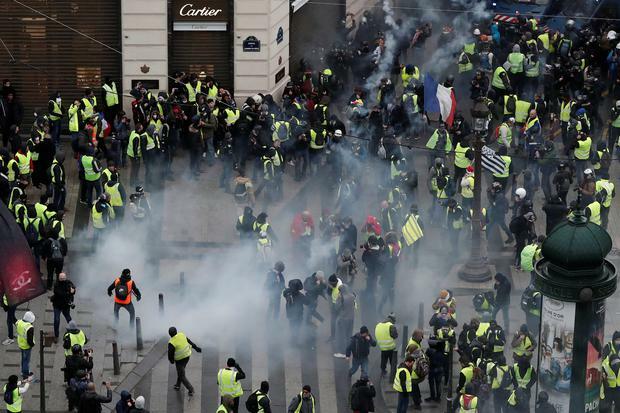 The protest movement will have “a severe impact” on the French economy, Finance Minister Bruno Le Maire told Reuters on Sunday as he toured an upmarket central Paris neighbourhood that had seen heavy looting Saturday night. “We must expect a new slowdown of economic growth at year-end due to the “yellow vest” protests,” Le Maire said, adding that he would provide more details in coming days. Prior to the protests, economists had been expecting growth to pick up after a weak first half of the year as tax cuts aimed at boosting purchasing power took effect. Gregory Caray, owner of two furniture shops in the heart of Paris, said he was relieved to see that his shop had not been vandalised, but the protective wooden boards over its windows were plastered with graffiti. “You can understand the yellow vests movement. But this is completely unacceptable. It has been three weekends in a row now. Look around you, everything is broken, damaged. All the shops had to close and spend money to shut everything up, and it happens every week,” he told Reuters. 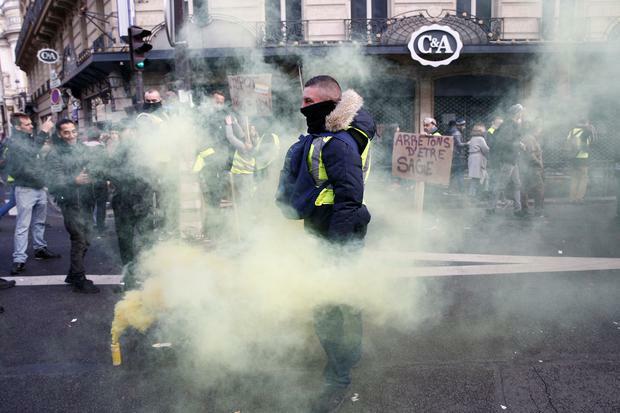 The government this week canceled a planned rise in taxes on petrol and diesel in a bid to defuse the situation but the protests have morphed into a broader anti-Macron rebellion. “I don’t know if Macron’s resignation is necessary, but he must completely change course and increase wages and lower taxes,” said Bertrand Cruzatier as he watched cleaners scrub out anti-Macron grafitti at Place de la Republique. In the centre of the square, a banner hanging from the bronze statue of Marianne, symbol of the French republic, read: “Give back the money”. Macron’s last major address to the nation was on Nov 27, when he said he would not be bounced into changing policy by “thugs”. “The President of the Republic will … make important announcements,” government spokesman Benjamin Griveaux said on LCI television on Sunday. He gave no other details about the timing, content or format of the speech. “However, not all the problems of the ‘yellow vest’ protesters will be solved by waving a magic wand,” he said. 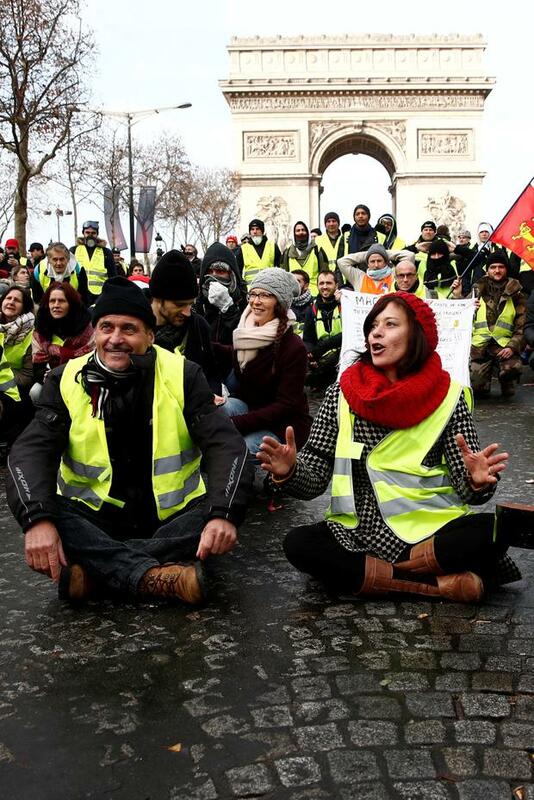 Yellow vest protesters demand lower taxes, higher minimum wages and better pension benefits. But, mindful of France’s deficit and not wanting to flout EU rules, Macron has scant wriggle room for more concessions.